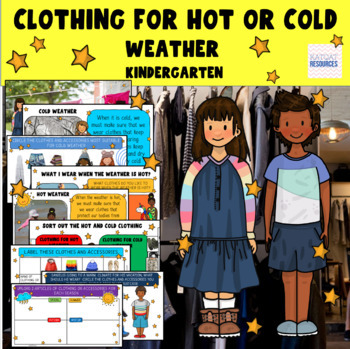 This is a no prep lesson when introducing what kind of clothes we should wear for what season and to assess how much children already know. 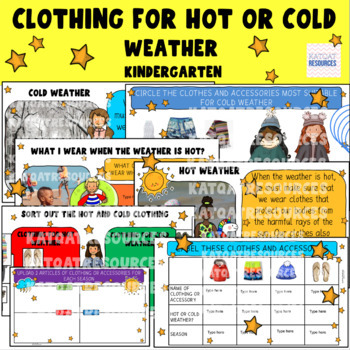 This is an easy to follow lesson which also allows you to still express yourself as a teacher but to explore the theme of clothing in hot and cold climates. The presentation is bright and engaging and each image is png. which can be copied into your interactive whiteboard if you need to . Worksheet writing frames - sorting clothes, naming them listing and organizing them in a table. Drawing a picture of clothes for a particular season.